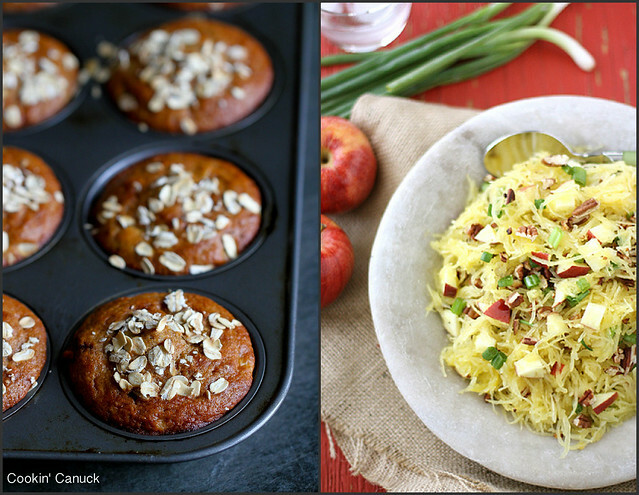 Bring on the healthy desserts to keep things in balance for the holiday season! 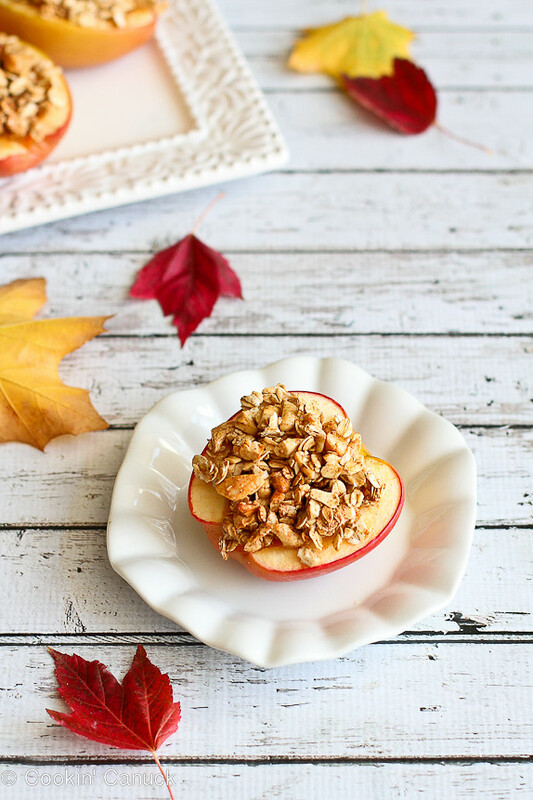 Cashew, maple and oat-stuffed baked apples are a popular fall recipe. It’s time to put the pantry on lockdown. There is Halloween candy in the house! (Cue horror movie scream.) We bought the big Costco bag, full of many of my favorite mini chocolate bars. And the only way I can deal with having it in the house is by NOT OPENING IT until 5pm on Halloween night. “Not open = off limits” in my world. Then again, if I completely deny myself…well, that’s not good for anyone. Bitter, snarly – a perfect match for that witch costume hanging in my closet. So, I compromise. And that is where these awesome baked apples come in. Hail to the baked apples! The vessel itself (you know, the apple) is full of vitamins and other good nutrients (scroll down to A Helping of Health for details), so that’s a good start. What really makes or breaks baked apples on the “health” scale is what you put inside. I started by cutting the apples in half because, for me, a full stuffed apple is more than I need for a snack or dessert. The only part I scooped out was the core, leaving the rest of the apple intact. What I decided to stuff the apple was inspired by what was inside my pantry. NOT the Halloween candy.
. I could have added in some butter or brown sugar, but I was looking for a more natural sweetener and I found that the syrup glued everything together, making the butter somewhat unnecessary. I opted them in the oven and 25 minutes later, we were treated to a satisfying, perfectly sweet dessert. By all means, serve the stuffed apples with some frozen yogurt or plain yogurt if want an extra dollop of creaminess. We’ve heard it since we were little. “An apple a day keeps the doctor away.” While that is just a fun saying to toss around when your kid insists that candy is truly the best thing for him, there’s some truth behind it. Apples are a powerhouse source of Vitamin C. However, take note that most of that Vitamin C is stored near the skin, so eat the peel whenever possible. Antioxidants are the nutrients that help to reduce the risks of certain cancers. Wouldn’t you know that apples are chockfull of antioxidants? Bring on the healthy desserts to keep things in balance throughout the year! 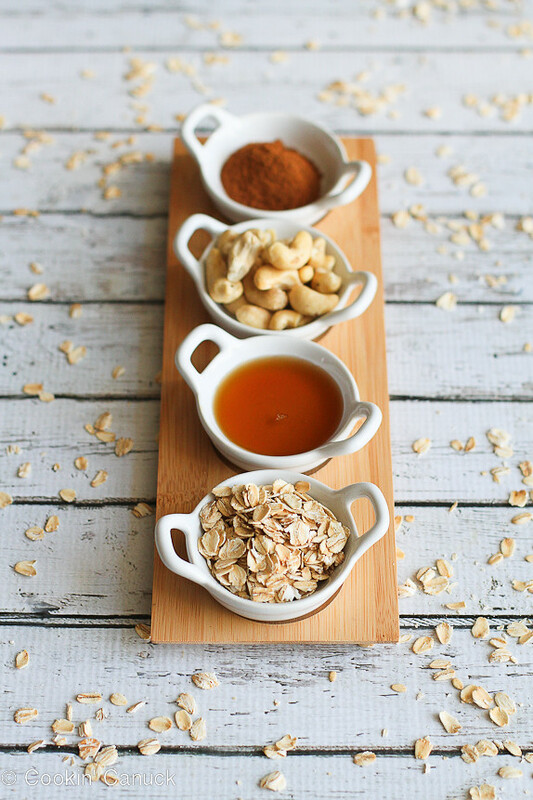 In a small bowl, stir together the oats, cashews, maple syrup, cinnamon and salt. Cut the apples in half through the stem. Using a paring knife and small spoon, scoop out the core. 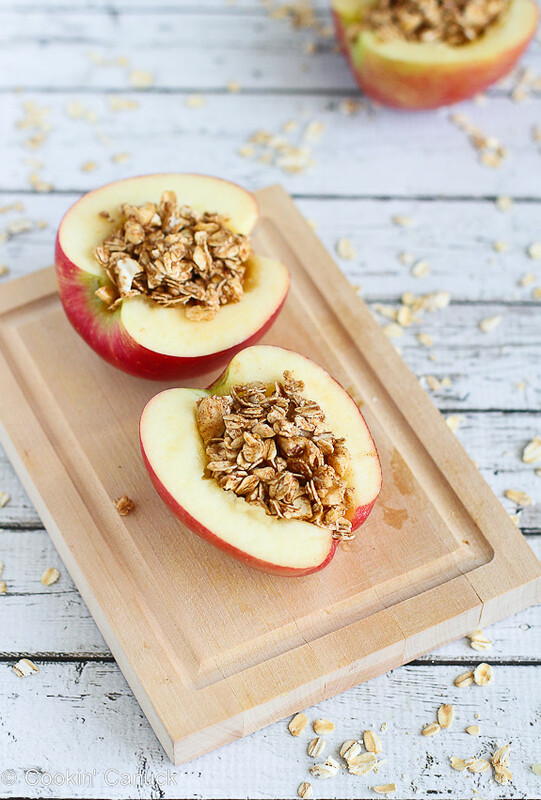 Divide the oat mixture evenly between the apple halves. Place the apples in a baking dish filled with ¼-inch water. Bake until the apples are tender when pierced with a fork, 25 to 30 minutes. Serve. This is such a cute idea and I bet kids would go crazy for it with a dollop of greek yoghurt! So, I have been trying to decide on a vegan dessert to bring to a Halloween gathering tomorrow, and this is so absolutely perfect! Thank you! Cannot wait to try ’em. I just opened the Halloween candy. So far I’ve limited my consumption. This baked apples would definitely win over candy. They would so delicious. I’ve lost count of all candy I’ve been through already. BUT, I started experimenting in July. Food bloggers get a pass, right? I got married in October. In an apple orchard. So, naturally I love this…and those photos are gorgeous!! I love the maple syrup and cashew addition – such great flavors all going on at once! 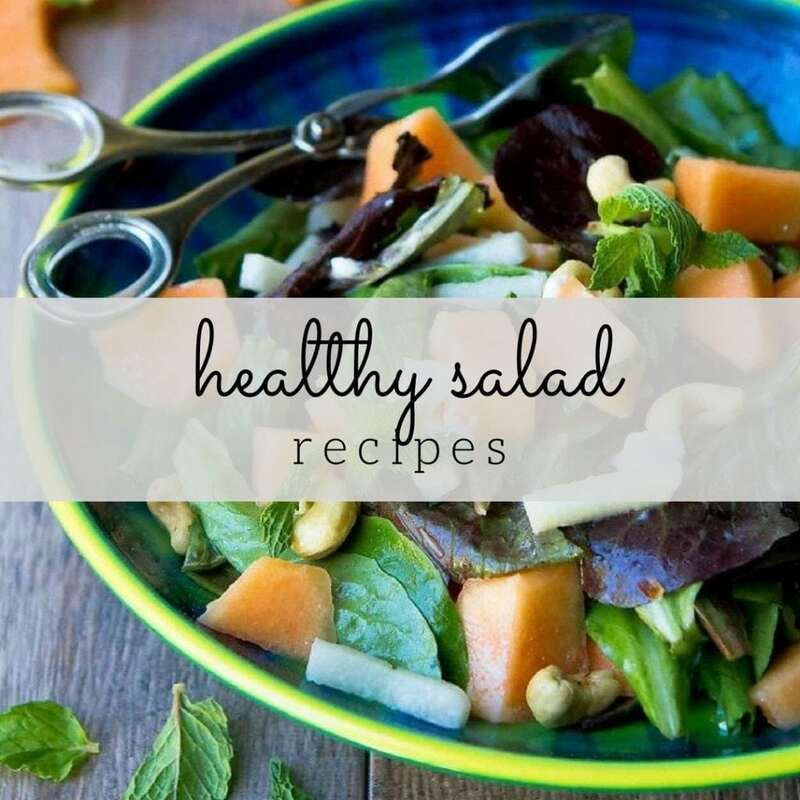 This looks both delicious and healthy! What great way to have something sweet and still be healthy…thanks for sharing! I’m always looking for ways to satisfy my sweet tooth while still getting in my fruit. This seems like the perfect recipe to accomplish both. Can’t wait to try it! I must say that going in the opposite direction of the Halloween candy was a good thing. Look what you turned out? These baked apples look and sound so delicious. You know what? I’d much rather have one of these awesome apples than any Halloween candy! They sound scrumptious. 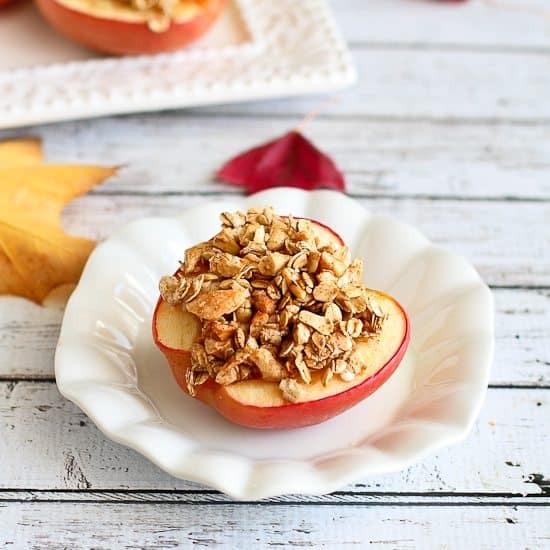 I LOVE that you made these baked apples rather than eating the candy in your pantry. . I’ve been ok with the Halloween candy but now that we’re getting closer. . those mini snickers bars keep calling out to me. . need something better to put into my mouth! 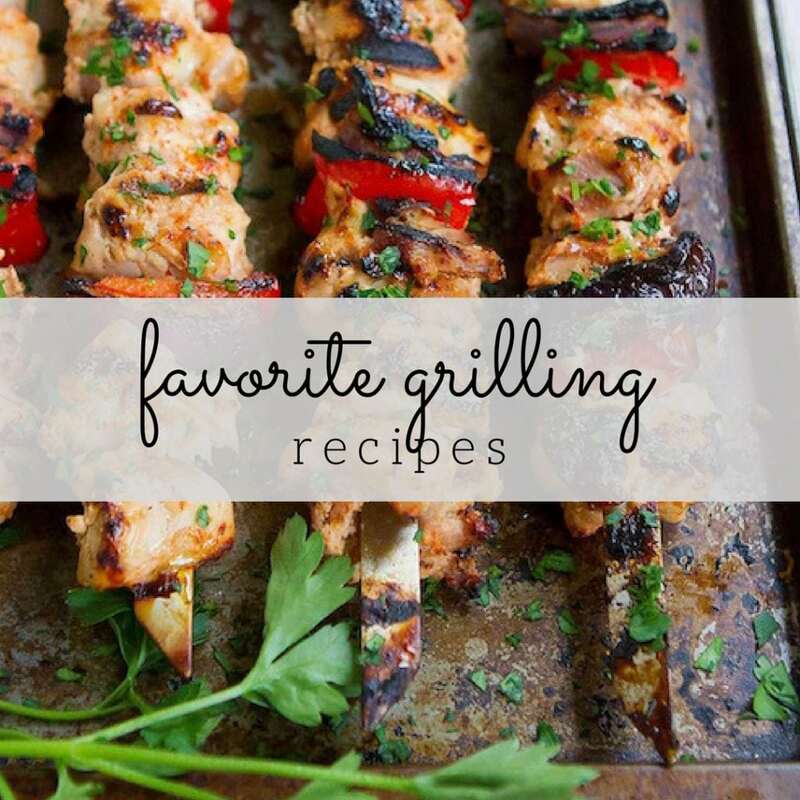 Love this recipe and pinned!! My husband tried buying that same Costco sized bag two weeks ago and I said no way!! Which reminds me – we still have no candy – oops! BTW This looks amazing and your photos are stunning!! Dara, I just love these apples so much and that you sweetened them with maple syrup. They look perfect! 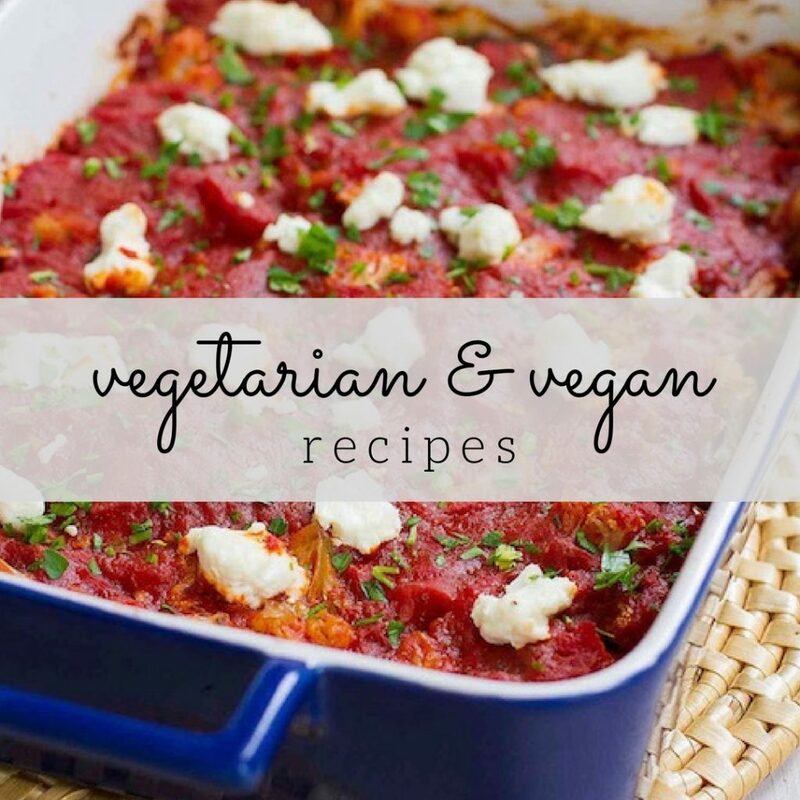 This recipe looks amazingly delicious Dara! And I like your method of resisting the candy.. can’t open it til the trick or treaters come! These look so good! I can’t be trusted around Halloween candy either. We decided to give out glow bracelets instead so we don’t have to have any in our house. I think this is the most awesome looking baked apple I’ve ever seen! I could totally eat this for breakfast (is that allowed?!). Plus you added cashews, which wins in my book. Wow. Now that’s a delicious treat that I wouldn’t feel guilty about eating! Where can you find Braeburns in the Fraser Valley? I’ve looked and looked for them but I’m told the season is over and I’ll have to wait for next year. I have to start making desserts like this…my kids have been in major ice cream mode since summer and I am having mom guilt 🙂 I love apples, and these look SO good! Thank heavens for you!! We had a handful of kids stop by to trick or treat this year. You know what that means? I’m eating ALL the candy!! This is a recipe me and my hips can get behind. Gorgeous baked apples! I love that you sliced them in half instead of cooking whole! 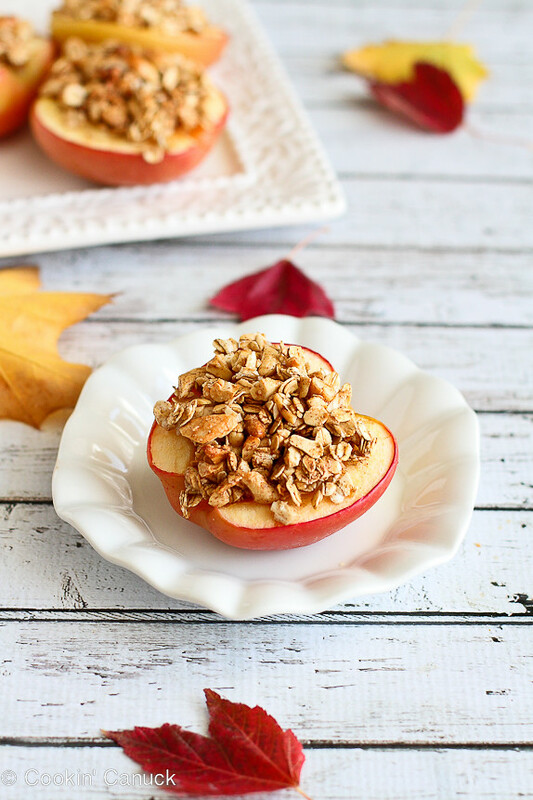 These are such a great snack idea…so funny last week, I attempted to make a sliced baked apple with “leftover” Halloween candy – umm yeah, that turned out about as good as it sounds…blech! Yours however…perfect! I want this for breakfast! And beautiful photos!